Every girl seeks out the perfect way to obtain flowy, shiny hair, right? Well I currently own two products that I had bought because they claimed to make give my hair a nice, healthy shine. Here are my thoughts on both! My Experience: This is definitely NOT weightless! It is a super super greasy product and does nothing but make your hair oily! It smells okay though.. it is sort of a heavy/ not-very-fresh citrus scent. I also had a friend who tried this product and she feels the exact same about the greasiness. For her though, she couldn’t get it out of her hair! It took her like 2-3 days to wash it out! How I Make It Work: I will sometimes apply this to the ends of my hair when my hair is still damp from the shower. This way it doesn’t weight down my hair as much because some of it evaporates with the water since I air dry my hair. 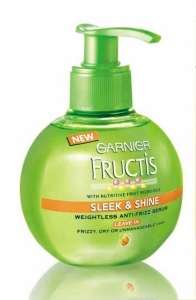 My Experience: This product is definitely better than the Garnier Fructis one. I was really timid to try another shine product after the first one because I figured they were all going to make my hair heavy and greasy. When I asked the lady at the salon about a shine spray, she recommended this to me. There is definitely silicone in this and it makes my hair sort of waxy.. but nonetheless still smooth and shiny. The spray has a light citrus scent to it that smells like a mix of oranges and silicone. lol This also has UV protection in it so that’s great! How I Make It Work: I think this works well all over on dry hair but sometimes I apply it on my roots after my hair is damp from a shower. Only use ONE spritz though because your hair will get oily if you apply too much product! I spray this about a foot and a half away from the top of my head and run my fingers through my hair once it has all settled. So if I had to recommend one of these products, I would definitely go with the Fantastic Sams Spray Shine. I'm not kidding when I say it's a miracle shine serum and that cheap for it. Plus you get a lot too. And it smells good. The restorative treatment is great too. Haven't tried the shampoo or conditioner yet. Anyway thought I'd help you out. It's better than Biosilk which I think is great, but expensive. This stuff seriously is the best, sorry I keep going on about it haha. Good luck with it! I've never tried a shine spray!